Let’s get wheelin’ and sealin’! The Speed Master Utility Cart is sure to make your detailing job or hobby a much more enjoyable experience. You’ll be able to quick and effectively work your way around the car without having to worry about constantly running back and forth to grab differently products and tools. The Speed Master Utility Cart has locks on the wheels to ensure that your detailing supplies don’t go rolling off down the street. Because the Speed Master Utility Cart has three separate tiers, you will have more than enough space fit every product and tool you will need for your detailing job. 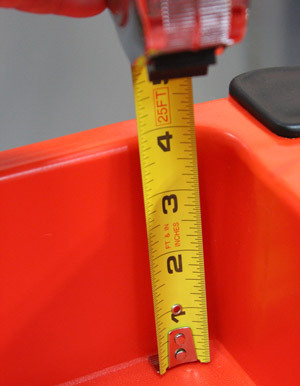 The durable construction of the Speed Master Utility Cart will ensure means that this cart may even outlive your car! When you are detailing, there really isn’t that much room to set anything down while you are working your way around the car. Setting things on the ground opens you up to the very serious risk of contamination or dirt finding its way into your towels, pads, or products. And setting your detailing supplies down on the paint you just spent all that time detailing is about as counter-intuitive as you can get. Now there is always a table, but then you have to constantly walk back and forth while you are detailing to grab the next product or tool. Detailing is already a time-consuming project, why make it worse? With three tiers of shelves, the Speed Master Utility Cart easily holds all of your bottles in place. Plus, look at this tech tip by Mike Phillips - you can hang your Scangrip Multi Match Light on a shelf and use the brakes to park it just where you need it! The Speed Master Utility Cart is the perfect solution to this very prominent issue. You will now have the perfect surface to lay your polisher down on. You could also use the Speed Master Utility Cart to store the tools or products you will need for the next step of your detail without having to run back to your garage to grab them. The wheel locks mean that your tools and products won’t move an inch unless you want them to! We know that during any given detailing job, you will need quite a few tools and products to make sure that the job gets done right. Lots of supplies mean you need lots of space to store all of that stuff while you are working around your car. The Speed Master Utility Cart has three separate tiers, each of which has 640 square inches of prime supply-holding real-estate. This gives you a total of almost 14 square feet of storage space! With 4 inch deep shelves, your bottles, towels, pads, and brushes won't fall out while in transit - with the Speed Master Utility Cart, you can now become a "mobile" detailer! 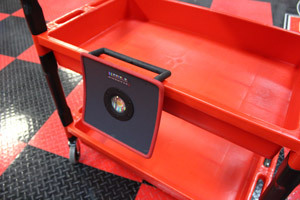 But not too mobile - The Speed Master Utility Cart also features locking casters to keep your cart where you want it! Detailing is often an outside sport, so your tools are naturally subjected to the pretty severe elemental that come along with that. Luckily, the Speed Master Utility Cart was built tough enough to stand up to any kind of risk you would run into during your detailing. The durable, high-density polyethylene construction of the Speed Master Utility Cart may even cause this convenience supplying cart to outlast your paint job! Very sturdy with lots of space. Wish I had picked this up sooner. I purchased the Speed Master Utility Cart during one of AutoGeek's special sales and it arrived days later. Assembly was simple. The cart is reasonably heavy duty, very light, rolls easily with large wheels, attractive, corrosion proof, and larger in person than I'd imagined. I find myself using it for more than just detailing and have relegated my older steel mechanics cart to the barn. The only thing that that I'd add is a power strip. So I purchased a one with an integrated cord winder and clipped it on the side so it can be easily removed if/when necessary. This may be the last cart I'll ever buy for my garage and so far I'm delighted. 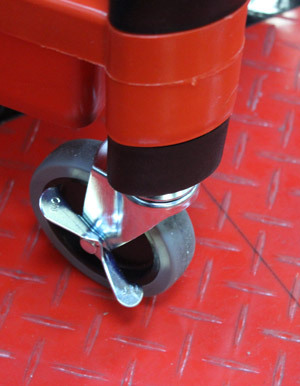 ProsSurprisingly strong & heavy duty, Light and easy to move around when loaded Large wheels navigate expansion joints in floor easily. Attractive and easy to clean. Larger than other carts I have purchased.